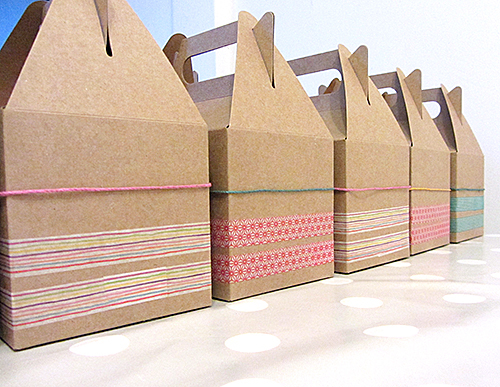 This is a quick and ridiculously simple project, each box taking approximately 5 minutes to assemble and decorate. This is what you want when you have a dozen of them to make! My daughter and I had a slow start as it took us some time to figure out the right design but after that we were flying, making boxes after boxes for my husband to fill. The nice part about this project is that it allows to play with colours. You can go for matching or contrasting elements, creating some yummy combinations in the process (= crafter happiness). We decided to make each box unique with its own combination of tape/twine/button but you could also make them all the same. 1 – Stick two parallel lines of washi tape at the bottom of the boxes. Make sure to start on what will be the back of the box. 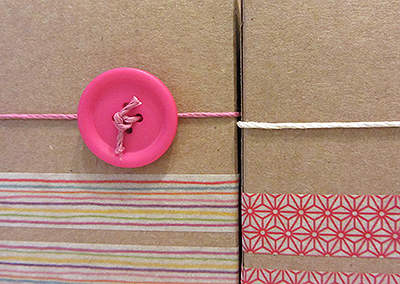 2 – Cut a piece of cord long enough to go around the box plus comfortably make two knots. 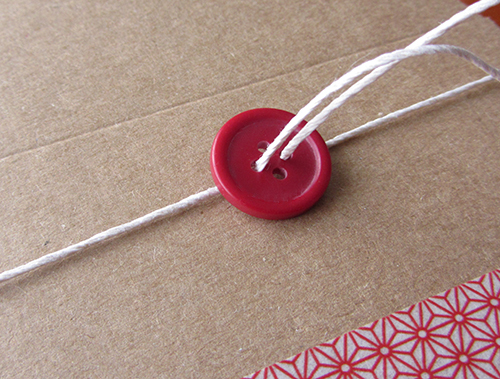 Thread each end of the cord through a button hole and position around the box as shown on picture 1. 3 – Secure the button by making two tight knots. 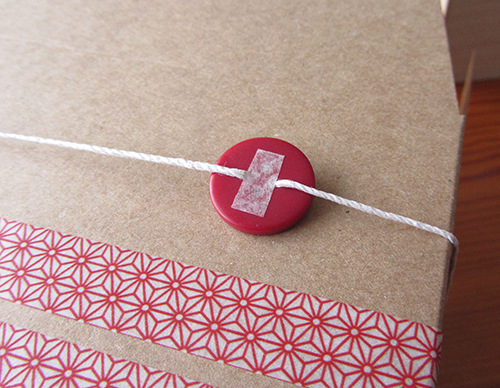 Stick a small piece of double sided tape at the back of the button as shown on picture 2. Then stick the button into place. You are done, D-O-N-E, how quick was that? Now I am off to finish the birthday cakes. This is my duty to make sure none of those go to waste. I know, I am a hero. Love these little boxes. 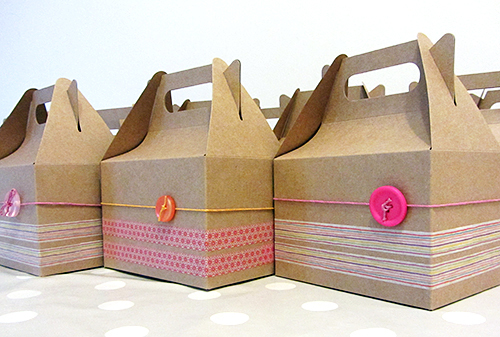 I am always looking for pretty packaging for baked goods to give to friends. The stuff I buy is so expensive and not half so pretty. Making these! Thanks for the kind comment. The best part is: they are also very fun to make! Hi Raphaële! They look so cute! I hope you had a great time! !